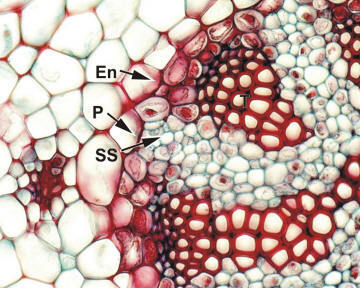 In this detail of L. claviatum you can see that the xylem is broken up into smaller groups, and the phloem tissue is generally composed of a wider band than is visible in L. saururus Sieve cells (SS) (cells with clear lumen) are surrounded by nucleate parenchymatous cells interspersed with albuminous cells. The stele is surrounded by an endodermis (E) and beneath this, a pericycle (P). a small satellite vascular bundle to the left, represents one of the vascular traces associated with a microphyll.